Last week my friends Becca and Amy invited Lena and I to go to Taormina. I’d already heard about this gorgeous town on the coast. It’s known for little stores filled with handmade wares, sparkling beaches, blue water, and classic Italian architecture. 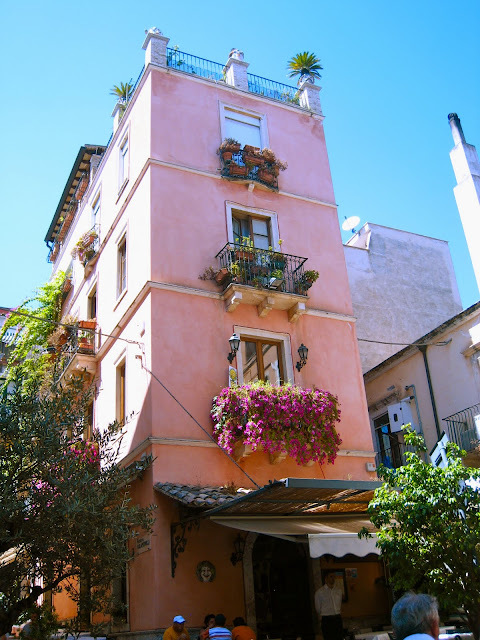 I guess by “classic Italian architecture” I just mean… picture your quintessential Italian town and you’re thinking of Taormina. The best part of this plan is that Becca has 3 kids (the oldest of whom just turned 4) and Amy has 3 kids (the oldest of whom also just turned 4). Three women, seven children… and go. Parking was a harrowing experience with 2 American-size vans. I’ll save you that. We boarded a cable car for 3.50 euros for each of us adults. All seven of the kids were free, thank goodness. The gondolas carried us from the beach area of Taormina to the cliffs where the other half of the town is located. Once at the top, the moms were in go-mode. I hope to have at least 3 kids (more like 4… or 5…) and so the entire experience with the mothers was a snapshot into my future life. Here we were, mingling with all the snazzy tourist couples. Can you tell which group I was with? Taormina wound its way before us: one sunny piazza after another filled with cafes and gift shops, twisting streets bustling with tourists, and Italians in trucks and motorbikes zipping through it all. 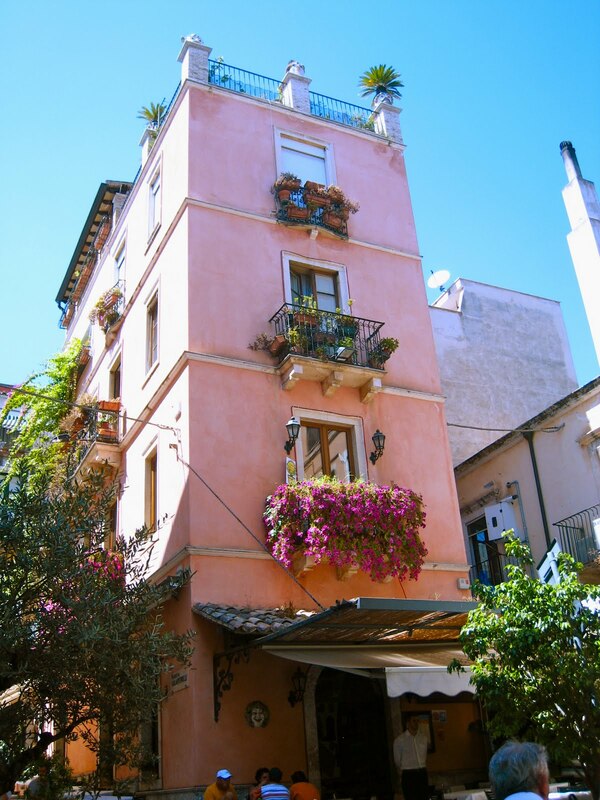 One of my favorite things about Italy so far is the balconies filled with flowerpots. Eventually we reached our destination: a gorgeous park on the edge of the cliffs. There were miniature Italian stone castles, aviaries with exotic birds, fountains filled with fish, and playgrounds where the children ran wild. Or ate the sand. Depending on their age. Lena hung out in the shade with me. The view from the park was spectacular. This is the view—and the water—for which Taormina is so famous. The giant smoking mountain in the background is Mt Etna, the gentle active volcano that dominates the view this side of Sicily. After more fun and games we left the park and wandered back up through the town. We were on a mission to find granita (grahn-EE-tah), which is like a slushy fruit sorbet. It's my new favorite thing in the world after pistachio ice cream. This Taormina shop is famous for its granita. And then it was time to go home. 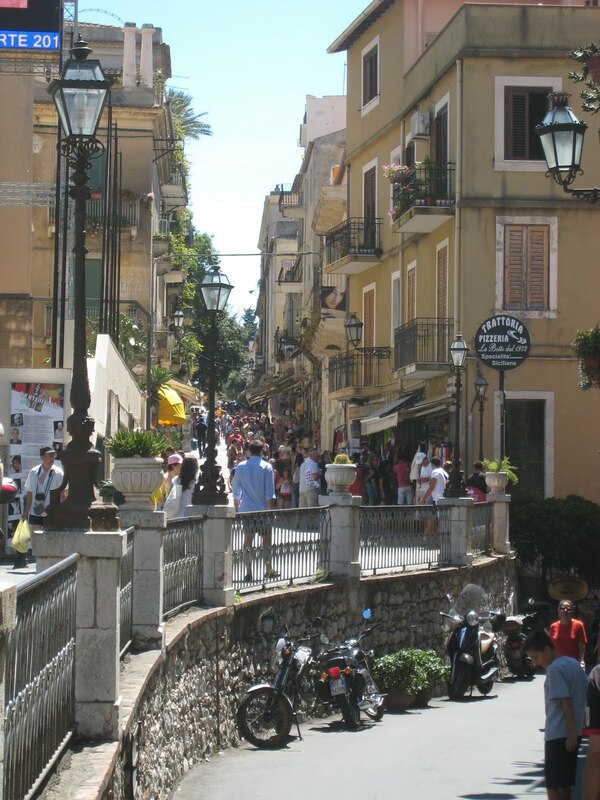 Taormina is all hills, so check out these moms and strollers and baby carriers! Will I be such a champ one day, trotting off with another mom and multiple children to foreign towns for play dates? I hope so! I love this story Becca and can definitely see you toting an entire Garber clan off for exotic play dates :) Miss you! Will every comment I make be, "It is beautiful!" If so, then I know you are grateful to be living in such circumstances and with already other young mom friends to gallivant around with (with lots of little ones to make it interesting). Lena's blue eyes appear to be lightening up! And you look terrific too, Becca! 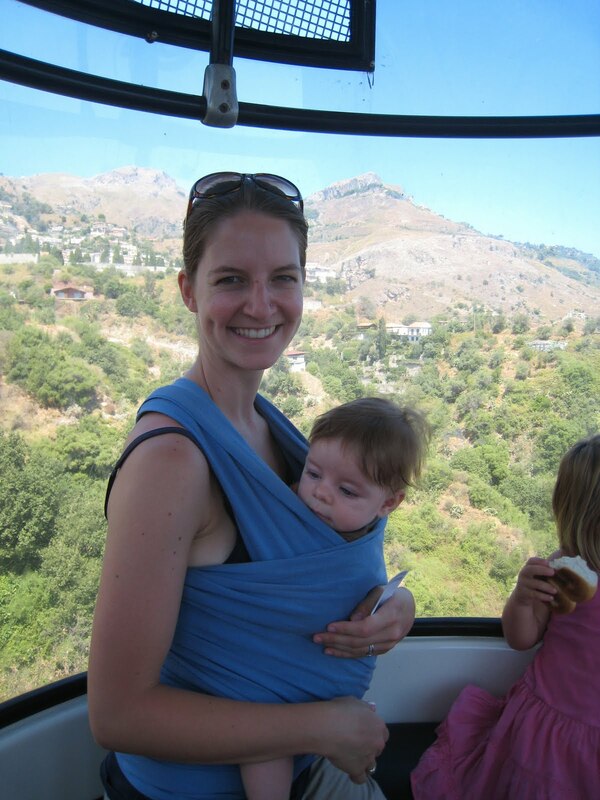 so delightful...makes me want to be there and to push the stroller up the hills with you, dear young garber family! This is awesome! What kind of a baby wrap were you using? The Moby wrap! It's my favorite for 0-4 months. Ah, the delicious granita from Taormina! which flavor did you pick? The mulberry one is really great... especially for breakfast, served with the "brioche": really refreshing during summer!